As promised, a follow up to my last post about DIY salad dressings. In the midst of winter, flavorful tomatoes are in short supply. Sun-dried tomatoes are a good way to bring tomato flavor into the depths of winter. Here’s a creamy, flavorful dressing that goes beyond the basic vinaigrette, but is still quick and easy to make. • Immersion (or “stick”) blender, food processor or blender. • Soak tomatoes in hot water for 15-20 minutes. 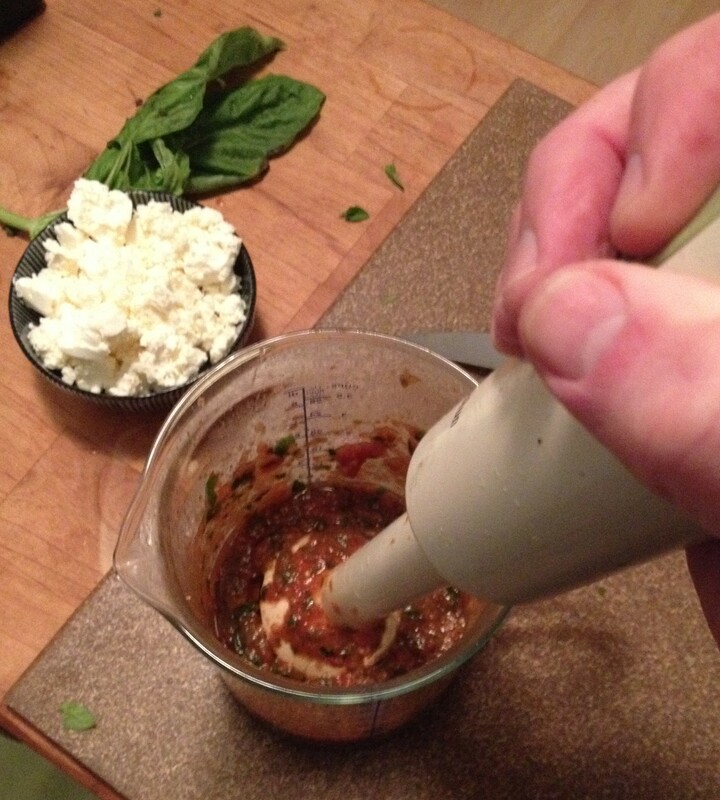 • If using immersion blender, place all ingredients except feta and oil, in a tall, clear cylindrical container or measuring cup. Blend until fairly smooth. • Crumble feta and add to container. • With blender running, slowly drizzle in oil. • If consistency is too thick, blend in water, one tablespoon at a time, until desired consistency is reached. Other herbs, such as marjoram, dill, parsley or chives may be substituted for basil according to your taste. 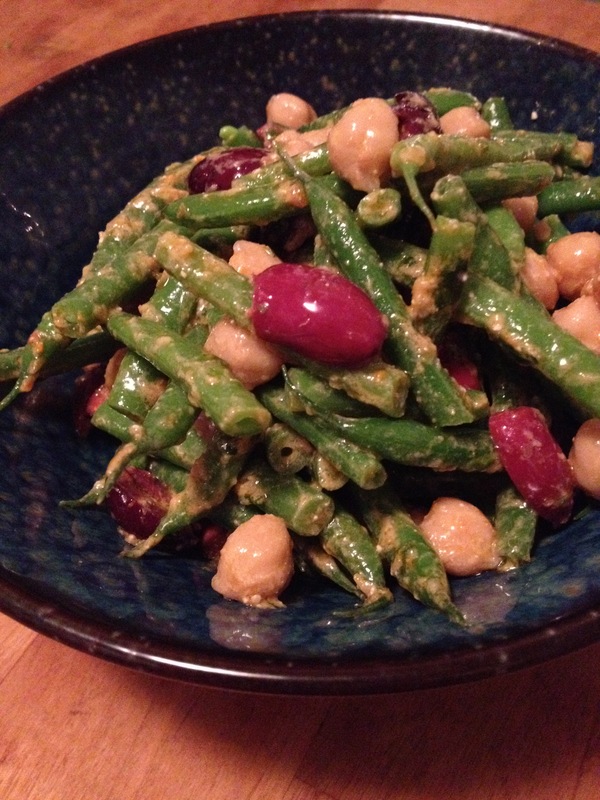 This dressing works well on a traditional greens-based salad, but its bold flavor also works well when mixed with blanched and chilled green beans, drained and rinsed garbanzo beans and chopped Kalamata olives (as pictured below). You can substitute other green veggies (broccoli, Brussels sprouts, cucumbers or even kale) for the green beans. And cooked grains (farro, wheat berries, barley) or any other type of canned beans can replace the garbanzos. 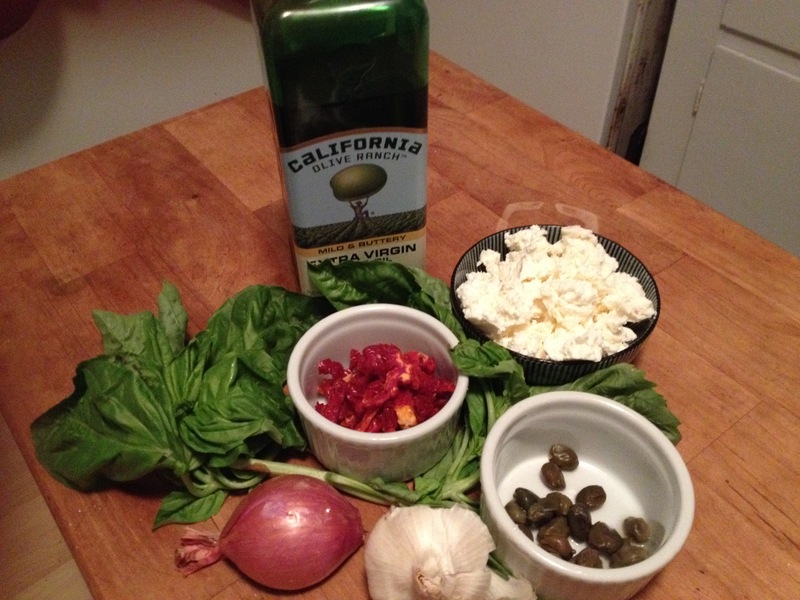 Posted on January 15, 2015, in dressing, food, recipes, salad, Uncategorized, veggies and tagged basil, beans, feta, food, olives, recipes, salad, salad dressing, sun dried tomatoes, vegetarian. Bookmark the permalink. Leave a comment.